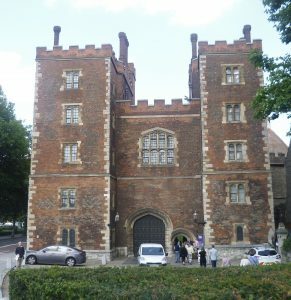 Lambeth Palace, situated on the south bank of the Thames, more or less opposite Westminster Abbey, has been the official London residence of the Archbishop of Canterbury for over 500 years. Its garden is one of the oldest in the country, though it has, of course, undergone numerous transformations as times and garden fashions changed. The garden is open to the public on the first Friday of the month from April to September. And I’ve just been to the last open day of 2017. We enter via the 15th century gatehouse which leads to a quadrangle comprising various buildings, including the chapel, the Great Hall and library, the archbishop’s private accommodation and various state rooms. They are all full of interest but, today, I’m concentrating on the garden. The first thing I notice are the fig trees, originally planted by Cardinal Archbishop Pole in 1556 (he was appointed by Mary I to oversee the reinstatement of the Roman Catholic Church). The figs are the ‘White Marseilles’ variety which crops twice a year with delicious sweet white-fleshed figs. 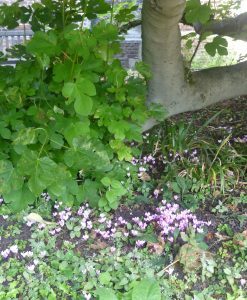 The trees are under-planted with native spring bulbs and, for the autumn, with pink cyclamen. Behind the quadrangle lies the palace’s ten-acre garden. It’s a bit of a hotch-potch, but I like that; a number of archbishops (including Cardinal Pole) have left their marks on the garden. For example, in 1992, Archbishop Robert Runcie planted a white mulberry tree to celebrate the release of his special envoy, Terry Waite, who had been kidnapped and imprisoned by Hezbollah in Lebanon five years earlier. 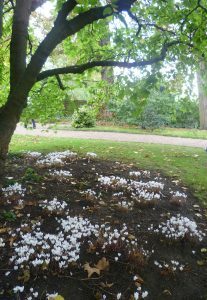 It is now a fine tree and under-planted with white cyclamen. 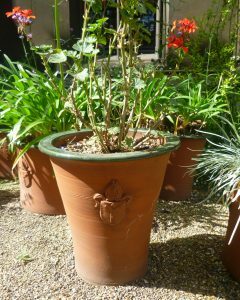 I was very taken by some of the terracotta plant pots – complete with an ecclesiastical crest as part of the decoration. They are varied in size and shape. I’m not sure if the crest belongs to a specific archbishop, the one who commissioned the plant pots, say; or whether it’s a generic Archbishop of Canterbury crest. Nearby a huge iron door stop (which looks as though it weighs a ton) props open a heavy wooden door. 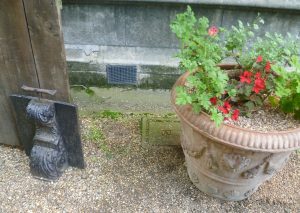 I rather liked how this photo of a slightly neglected corner turned out and I allowed the decorative plant pot beside the door stop to remain. Nearby, a couple of trestle tables have been set up to sell plant cuttings, plum jam and plum chutney. Unfortunately, I am too late for the honey (there are rows of bee-hives at the back of the garden). This is the last open Friday of the year and it’s good to see that they are doing a brisk trade; the money raised goes to the chosen charity of the month. The shape of the garden is essentially a long oblong with a sizable lawn nearest the palace with a raised terrace behind it. It’s exactly the right size for garden parties and outdoor entertaining, and that’s how it’s often used. 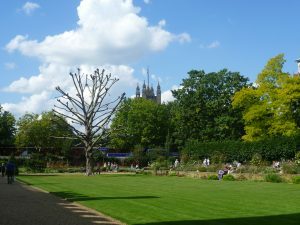 I rather like the decorative but ferociously pruned tree and the glimpse of Westminster Abbey’s tower through the trees in the background. 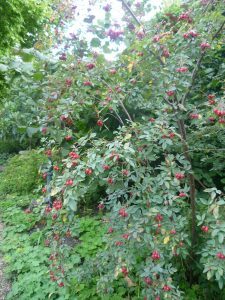 Behind the terrace, there is another open area which is more like a park, surrounded by trees: including a native hedge with blackthorn, field maple, hawthorn, hazel, wild rose, spindle etc. ; the Long Walk with plane trees, woodland shrubs and herbaceous planting; and a rowan avenue. Birds are not forgotten, and I stopped to admire the shapes of the tree’s branches contrasting with the large, slightly Gothic-looking bird feeder hanging down from a branch. 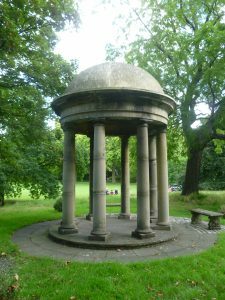 I love the elegant eighteenth century rotunda standing atop the Little Mound – which was surely built to show it off. Perhaps one of the eighteenth century archbishops had a meditative mind or a turn for poetry. The mound itself will soon be covered in early November snowdrops and snake’s head fritillaries will appear next April. 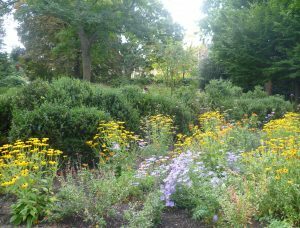 Just behind it is a long late summer border full of rubekias and what look like Michaelmas daisies. The palace garden’s summer planting is definitely coming to an end. Still, there are lots of berries to admire: rowan, hips and haws, pink spindle berries – not yet split to show their clashing orange centres, and doubtless the mulberries’ fruit, too; not to mention the fig trees’ October crop of figs soon to come. 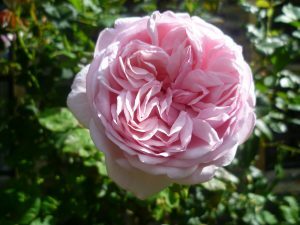 There are a very few roses still in bloom, including this beautiful pink one – and it has the most delicious scent. It’s a good note to end on. I really enjoyed seeing this garden and I’m looking forward to re-visiting it in the spring. Thank you for your comment, Anne. I agree with you, and I’m torn between wanting to do a post about a visit to a lovely place, and feeling that it’s not fair on readers outside London who can’t get to see it. Lovely. I want that plum chutney! Sounds utterly delicious. Love the rotunda. Bit of a folly, isn’t it? Can just see our Regency ladies posing between the pillars. Thank you for your comment, Elizabeth. Personally, I don’t see the Rotunda as a folly – it’s not pretending to be a bit of ruined castle, after all. I think of it more as a ecclesiastical acknowledgement of the importance of a Classical education! After all, at the time, most clergymen would probably have studied the New Testament in New Testament Greek. Though I could be wrong, of course, and there’s nothing to stop a bit of decorous flirting under its dome! There is a decorative pond at the far end of the garden too and I seem to remember a slender bronze girl standing in it. The raised long terrace is bordered with a variety of roses but by this time of year only a few blooms must remain. 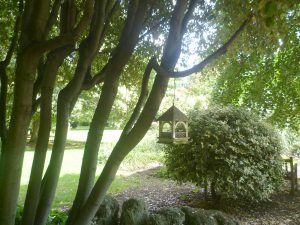 Although I agree with Anne that it is sad that it is so hard for out-of-town visitors to visit, there is still a special delight in entering a garden hidden behind walls and inaccessible for much of the time. It is a “secret garden”, so to speak, for one to explore. I rather agree, Pauline. 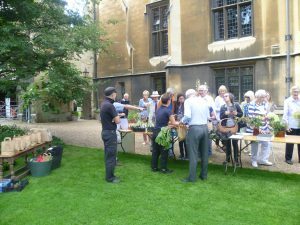 Even for Londoners, Lambeth Palace Garden is not easy to access It is only open to the public the first Friday of the month between April and September – that’s six times. Still, it is a working garden, used by the Archbishop of Canterbury for official events and a lot of people work there, and it’s his London home, too. I’m grateful to be allowed in occasionally! Yes, the roses were mostly over. I must try and visit in June when they’ll be at their best.